These delightful vegetarian burgers will not only wow your pallet but give you a new perspective on veggie burgers. The sweet nutty flavor of cracked farro combined with savory ingredients of thyme, tamari, and onion reveal a perfect vegetarian patty with a protein punch. 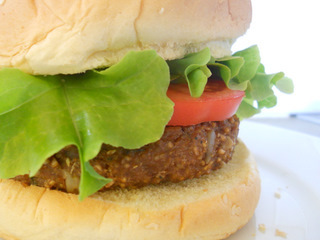 Make these vegetarian burgers for as a main coarse for lunch or dinner. Kids love them and they are easy to make! 2 drops liquid smoke (Liquid smoke is a natural seasoning from concentrate. It can found in most grocery stores. Be careful not to add too much as this seasoning can be overpowering). Bring 6 Cups of water to boil. Add onion, tamari, garlic powder, seasoning and liquid smoke, stir until well blended. With a heavy cooking spoon stir in cracked farro. Turn burner down to a simmer, stir frequently for 5 minutes. Add sunflower seeds and keep stirring until farro has absorbed most of the moisture and begins to thicken to the point that it is difficult to stir (about 10 minutes). Once mixture is too thick to stir turn heat off and let cool for 20 minutes, stirring intermittently to allow heat to escape. Turn oven on to 350 degrees. Lightly oil 2 baking sheets. When mixture is cooled begin forming patties. It is recommended to use rubber kitchen gloves or oil hands prior to shaping patties- they can be very sticky. This also helps with the heat. 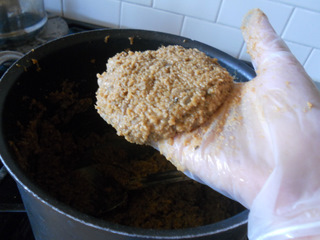 Use a large kitchen spoon to scoop out mixture, form patties 3″ wide by ½” deep. Place patties on oiled baking sheet. Bake for 30 minutes then turn patties over for another 20 minutes (a total of 50 minutes). Cool. Serve warm or cold between sandwich bread or a bun, just like a burger! These patties can be stored in the refrigerator for up to a week or in the freezer( pop them in the toaster oven for an instant burger. They make a delicious wholesome sandwich that the entire family can enjoy. ers will not only wow your pallet but give you a new perspective on veggie burgers. The sweet nutty flavor of cracked farro combined with savory ingredients of thyme, tamari, and onion reveal a perfect vegetarian patty with a protein punch. Make these vegetarian burgers for as a main coarse for lunch or dinner. Kids love them and they are easy to make!